This demountable touring installation was commissioned by O2 to coincide with the launch their Bluebook technology. Inspired by a pre-cinema building, The Cyclorama, this structure captures its location for a set period of time. 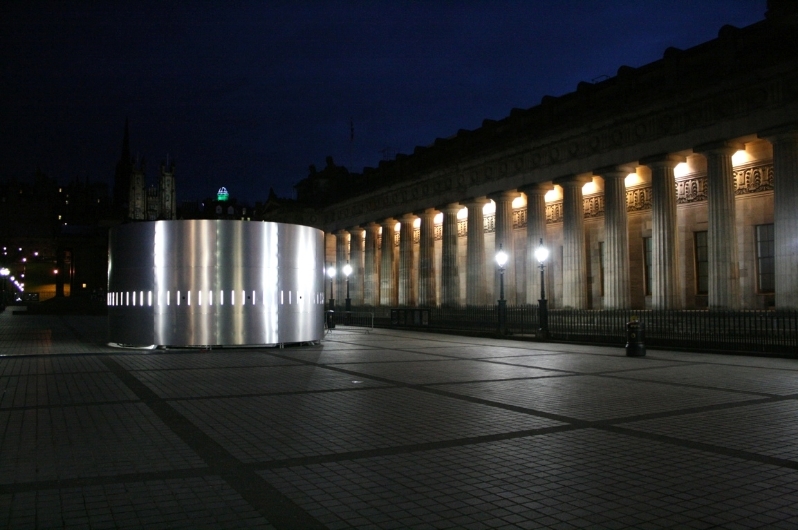 The drum continuously photographs the 360 degree panoramic view outside and displays it across a halo of screens inside. As viewers move toward the screen the images move back in time.. Using this intuitive haptic interface visitors can travel back in time to see historic views of the same location. The captured visual history was also broadcast online for remote viewing. The project was created by Jason Bruges Studio in collaboration with PD3 and Lite Structures.